The Assam Sanmilita Mahasangha (ASM) has demanded that the National Register of Citizens (NRC) authorities take 1951 and not 1971 as the cut-off year in the ongoing updation process of Assam’s citizens register. The ASM made this demand at a Press conference organised by the Bijoy Bey-led faction of the Karbi Students’ Association (KSA) in Dhubri on Wednesday and stated that taking 1971 as the cut-off year is “illegal”. Rahman also demanded that as per the United Nations Declaration on the Rights of Indigenous Peoples (UNDRIP) of September 13, 2007, the “political, social, land, education and economic rights of the indigenous people living in Assam should be protected”. The Hills Tribal League (HTL), KSA, Kuki National Assembly (KNA), Kuki Students’ Organisation (KSO) and the Karbi Students and Youth Council (KSYC) supported the said demand made by the ASM. 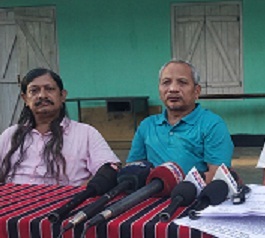 The HTL Convenor Khorsing Teron, KSA president Bijoy Bey and its General Secretary Moniram Tokbi and the KNA Convenor T Thouthang were also present in the Press conference.